According to information from the USDA, there are approximately 160 million Christmas trees growing on 3,204 farms in every state in the nation. But chances are none of them look like the ones growing on Michels Family Farm in Owen County. At first sight of the farm, it’s easy to see the difference with beautifully shaped trees lining the road before the main entrance. Jeff Michel, who spent much of his life in the logging industry before he retired, takes the time and care to trim each tree that is ready to sell, giving each one its own look and a real feel of Christmas. Fran McCall, coordinator of the Kentucky Farm Bureau Roadside Farm Market Program said the Michels family takes great pride in preparing each tree. “The fact that Jeff takes the time to trim each tree where they stand is unique in that it gives customers a firsthand look and what their tree will look like once they take it home and it just adds a magical look to the farm. There’s nothing quite like it,” she said. Michels is a part of the growing network of Roadside Farm Market members and is unique in other ways including the fact that several years ago this traditional tobacco farm’s owners began to diversify somewhat by accident long before diversification was as common in the Kentucky agricultural industry as it is today. Now it has been 25 years and pumpkins are still something grown on the farm along with gourds that have become quite the art project for Pam. 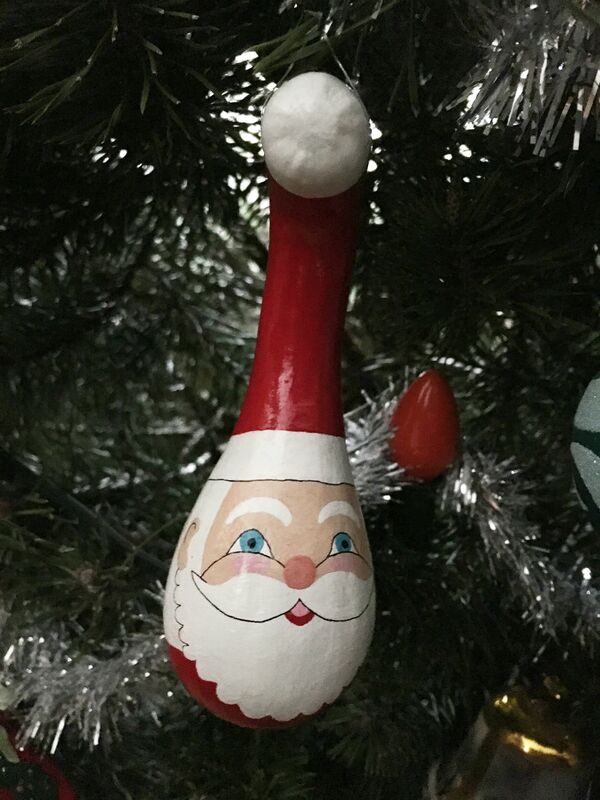 She took her talent for painting, discovered in college and nurtured during her career as an elementary school teacher, and creates decorative gourds that complement pumpkin and tree sales. 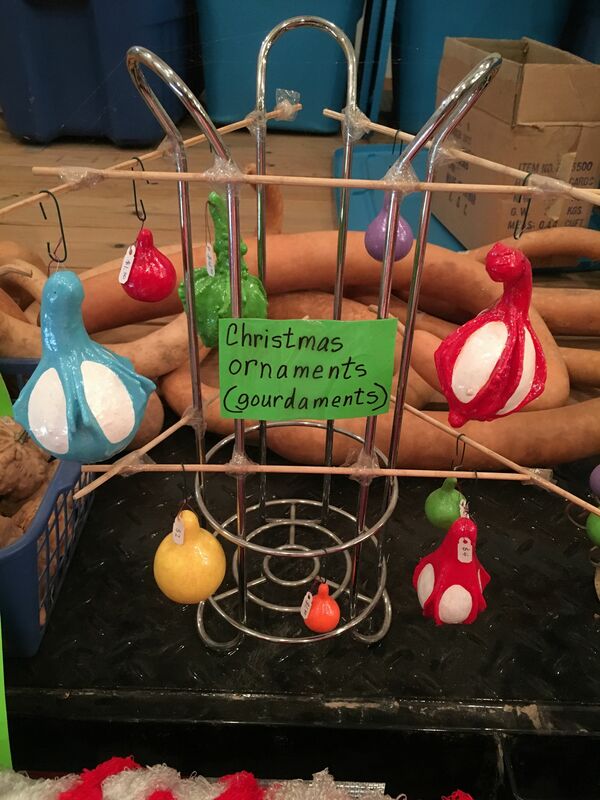 In fact, this time of year, she makes Christmas tree ornaments made out of small gourds. Michels Family Farm is true to its name as all four members help out during the busy times. But Jeff’s sister also raised Christmas trees on a Boone County farm for many years until the death of her husband. Many of her customers began coming to the Michels’ 135 acre farm and still do. Having that Christmas tree heritage in the family has likely been an advantage, but patience has also played a part in the success of the farm, as most Christmas tree growers know. It takes at least seven years to get a new tree big enough to sell and not all varieties of trees are suitable for Kentucky weather. The Michels understand that well and primarily raise three types of trees; Scotch Pines, White Pines and Canaan Firs. Since the first trees were sold five years ago, each season has seen a growth in sales, increasing exponentially over the last two. Much of that success is due to returning customers but social media is playing a big part, as well. In addition to the trees and painted gourds you’ll find at the farm this time of year, customers will also discover hand-made Christmas wreaths and swags, walking sticks made by Jeff, and a free cup of hot chocolate and Christmas cookies. For the last 30 years, this family has made their home on the Owen County farm. 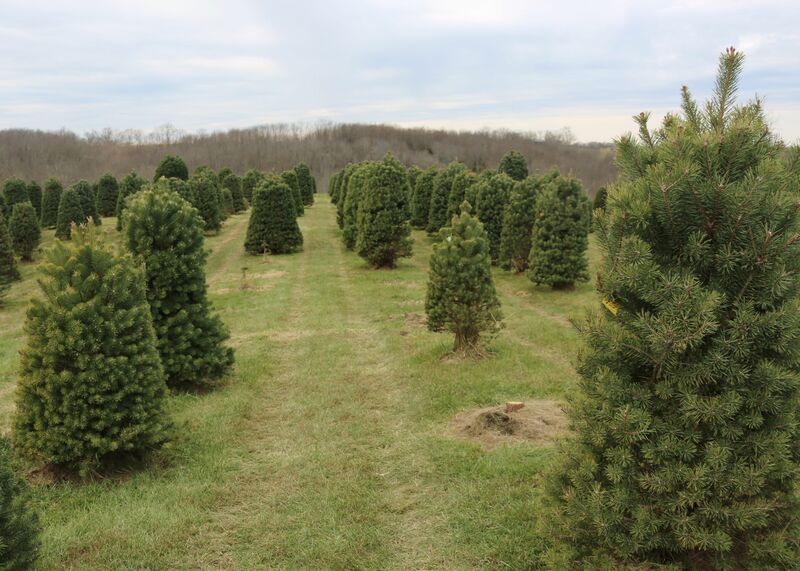 And at this time of year, it becomes home to many others as they create the annual tradition of finding their perfect tree at Michels Family Farm.